Can minimoons prime the pump at NASA to seek out larger asteroid targets in the future? 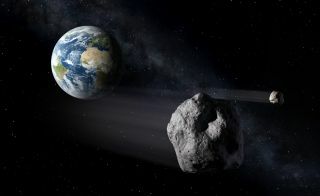 The space agency is drawing up bold plans to capture a near-Earth asteroid and drag it back to a stable lunar orbit, where astronauts could visit it in the future. But tiny space rocks called "minimoons" already cruise near our planet and would make interesting targets for manned exploration, advocates say. This illustration depicts a trajectory for a mission to visit a minimoon, a tiny asteroid in the Earth-moon space that may be great targets for astronaut visits. "Minimoons are really a new idea," said Bill Bottke of the Southwest Research Institute in Boulder, Colo. "We think they have a lot of promise." Researchers recently discovered that some near-Earth asteroids (NEAs) are temporarily captured in Earth-moon space. These minimoons, each several meters across, make at least one orbit around Earth, though some complete many laps, Bottke said. "It turns out that some asteroids very naturally find their way into the Lagrange points," Bottke said, referring to gravitationally stable spots in space. "They rattle around the Earth-moon system before they leave." Some minimoons may be in a "sweet spot," with long dynamical lifetimes inside the moon's orbit, Bottke added. Space scientist Bill Bottke is on the hunt for minimoons, tiny asteroids that could be great targets for manned space missions. Minimoons come in various dimensions, from the size of a washing machine to objects as big as a dump truck. "There's always something to visit," Bottke said. The tiny bodies offer new prospective targets for human exploration, he added. "We think they can probably achieve a lot of NASA's goals for the human spaceflight program in terms of visiting other worlds," Bottke said. "But we think we can do it at lower cost, possibly within the current NASA budget, and for a lot less mission risk." Bottke told Space.com that the "founding fathers" of the idea are Mikael Granvik of the University of Helsinki and Robert Jedicke at the University of Hawaii's Institute for Astronomy. NASA now needs a detailed observational and theoretical study to understand the mimimoon population. Some tantalizing hints have suggested that minimoons have already been spotted — but by the U.S. Department of Defense's (DoD) Space Surveillance Network. In 1994, that network detected objects on geocentric orbits. Their orbits matched "no known human activity" but did line up with hypothesized minimoon orbits. The DoD uses radar and optical tools to detect spy satellites from other countries, Bottke said. But the question arises: Can the military find — or has it already found — minimoons? If so, can the DoD release its data? Civilian skywatchers looking for minimons could tap the Subaru 8.2-meter optical-infrared telescope at the summit of Mauna Kea on the island of Hawaii , Bottke said. "We think we can find these guys with Subaru, probably one of the most capable telescopes in the world," he said. Minimoon backers see no problem in sending astronauts aboard NASA's Orion spacecraft to the diminutive objects. Crew members could even haul samples or the entire miniature asteroid back to Earth. Flights to these nearby objects would only take weeks, Bottke said. "There's intriguing science with these small guys," Bottke said. Minimoons are probably about the size of the fundamental building blocks from early solar system formation, he added. Bottke said that missions to minimoons can fill in strategic knowledge gaps at NASA, helping the space agency do more ambitious things later on. Reaching out and touching these objects would also help test resource-extraction ideas for larger asteroids. "Minimoons warrant a much more in-depth study than what's been done so far," Bottke said. "They can get humans back in the exploration business … which is what I like."